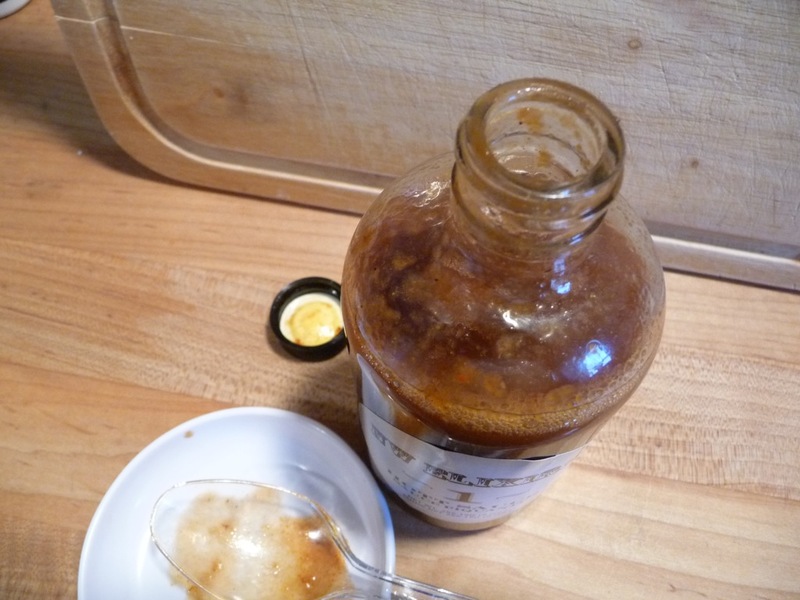 We’re kicking off the New Year with a review of a new company – NW Elixirs from Portland, Oregon. 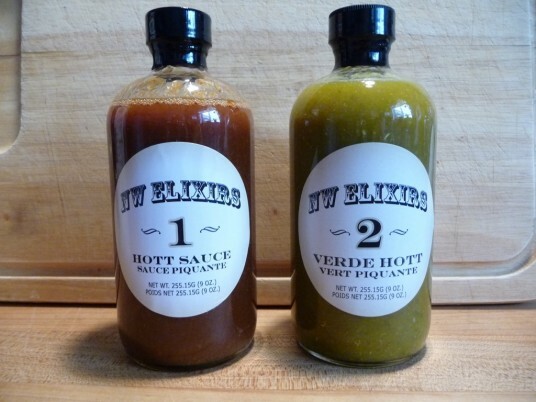 Created by Chef Andrew Garrett and waiter Mitch Miller, NW Elixirs launched their first sauce, #1 Hott Sauce, in September of 2011. This was followed quickly by their second offering, #2 Verde Hott. (Sources tell me their #3 Smoky Hott is getting great pre-release feedback. Stay tuned for that review in the near future). NW Elixirs doesn’t just make sauces. Our passion goes beyond food. We strive for pure creativity; we aim to inspire… Exquisite food unites powerful nations, and tightly bonds families and friends together in deep rooted relationships. This is our reason for existence. Apparently, these aren’t your typical hot sauces, and these creative individuals have created what they believe to be sauces that pair well with many types of foods, from lamb meatballs to chuck roast, fried chicken to oysters, even avocado dip and burgers are some of the many recipes that they feature using their hot sauces. These aren’t your typical bottles either. I love the entire look of the “packaging” – the word “Elixirs” with its “Old West” font, and most importantly the 9 ounce glass bottle resembles an old apothecary bottle. Something a “snake oil salesman” might have sold on the great Northwest Expansion trails. Here’s a real-time review and look at the sauces in depth. This is a HotSauceDaily first, as I’m writing this as I go along through the review process. With habaneros and jalapeño peppers, #1 is their dark red hot sauce. The ingredients are an impressive and creative list – with the inclusion of olive oil, honey, and molasses, I’m expecting a sweet back end. Texture & Appearance: – There is much settling of the ingredients and separation of the olive oil from the heavier components. I’m sure this is normal for this blend, and a vigorous shaking mixes everything up just fine. All of which only adds to the artisanal aspect of this small batch product. This is a very thin sauce, with bits of pulp clinging to the bottle and spoon. And from the spoon is just how I sampled this. Taste: – At first taste there is a nice, sweet and flavorful suspension – then the habanero heat kicks in quickly. The jalapeño flavor is there to temper the hab, but I get a fast burn in the back of my throat and up into the nose. It tastes very spicy and very “dark”. I can’t imagine this sauce on pizza or even nachos. The robust depth of flavor would be perfect in a nice batch of chili (with beans, thank you). And speaking of beans, I want to try this in some BBQ baked beans. Also, the deep, dark flavor would be great in burgers, or a chopped beef sandwich. I would stick my neck out and imagine it on pulled pork as well. Talk about hot and spicy midwest BBQ sandwiches! Also, on my next batch of tacos with my own taco seasoning recipe, I will be sampling both NW Elixirs sauces to see how they do as a taco sauce. I am bowled over by the complex flavor of this sauce. I should add here that I only wish it were much thicker. I feel the flavor is there, but the consistency is just too thin for my liking. 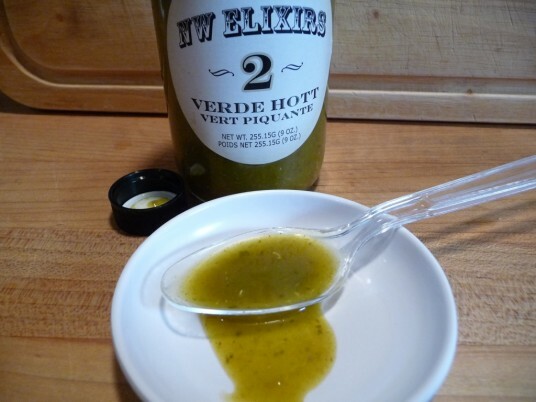 Perhaps if NW Elixirs could find a way to thicken it up, add some more pulp, then they would have a BOMB of a sauce. While the sauce is thin, the flavor is not. The flavor is sweet with a big, bold, dark and spicy profile. Very unique and complex – in a word, delicious. Heat Level: – I’m going for the middle of the road here, as it is quite hot, but it won’t hurt you, and is very palatable. I did experience a runny nose, sweaty head, and earlier – a sneezing fit from the spices. All good things, right? But, the heat actually fades quickly so you can go back for more sooner! And the great flavor of #1 Hott Sauce does not disappoint. Label/Graphics: – The label is simple, yet inventive. The nice burnished edge of the label resembles an old weathered look, and the dual English-French descriptions evoke the French-American culture of the Great Northwest. Kudos for the overall design and a huge 10 out of 10 for design and packaging. Overall Rating: – I love the presentation and the flavor, but the thin consistency loses points for me. And here is one of the few times I would desire a dropper top or “restrictor cap”. These small plastic inserts allow you to control the flow of a thinner sauce better, and not pour out too much at one time. The only other time I wished for one was with the Tabanero hot sauce. Otherwise, as most of us Chileheads and hot sauce bloggers would agree, the restrictor caps are just in the way, and we pull them out and toss them immediately. 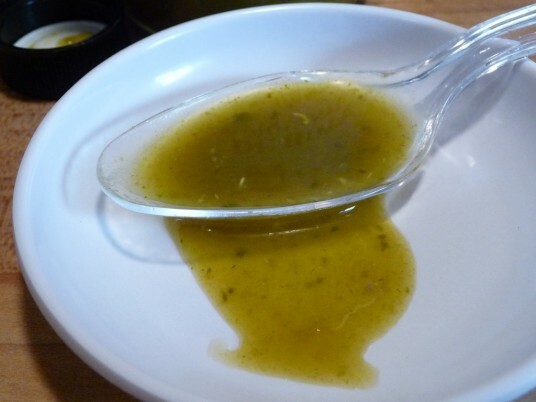 This is their green, tomatillo based sauce – a Salsa Verde. Another impressive and complex list of ingredients. 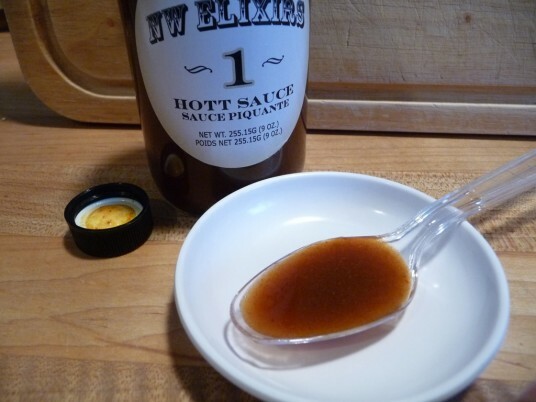 I had high hopes for this sauce – even to the point of it out-shining their #1 Hott Sauce. And since the serrano pepper is one of my favorite peppers for our home made salsas, I really hoped this Verde Hott would rock. I’m also a big fan of agave nectar as a natural sweetener. Let’s see how this sauce with its ingredients plays out. 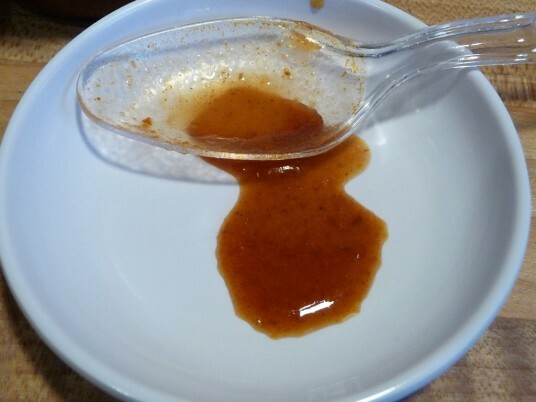 Texture & Appearance: – Again, this is a very thin sauce, so I won’t belabor the point. There is less pulp, but also less separation of ingredients as there is no olive oil in this one. Also I was surprised to see such a small number of the tomatillo seeds present. Taste: – s At first, both Marilyn and I detected a big, bright hit of citrusy lime flavor. What? There’s no lime in it. Must be the combination of the agave and cilantro. The citrus taste was very pleasant – a nice surprise. A good balance of garlic too – not too much. As good as their #1 was, the #2 was half as good. To me it had a very pedestrian chile verde taste. Nothing that special, and I was really hoping this was going to be the star sauce out of the two of them. Heat Level: – The serrano peppers are they only ones bringing any heat to this sauce, as the poblanos are very mild. In their dried form, poblanos are known as ancho chiles. Normally, I would equate tomatillos and serrano peppers as having a medium-hot heat level. I guess it depends on the type and quality of the serranos. The poblanos bring nothing to the table except maybe some darker flavor that is barely detectable in this sauce. The serrano heat was a bit tame for me, which is why I put it at only a 1 on our scale. (Marilyn thinks it’s hotter). Just goes to show you how subjective these “heat scales” or ratings we bloggers use, are. Overall Rating: – Again, half as good as the #1 Hott Sauce. I wish I could be more positive, but until they thicken it up and kick up the heat level, it’s just too average for me. Final Thoughts – Both Sauces: – I wish the shrink wrap was a serrated “zip-strip” style on all hot sauces and condiments. It would make removing the shrink wrap so much easier. And what is the cost to add that feature? Minimal? Perhaps it’s a limitation of the bottling facility – so get on that bottlers. It’s a small request. Back to the NW Elixirs bottles themselves… as an (expensive) suggestion, how great would a cork topper be with these unique bottles? It would enhance your package ten-fold. And who doesn’t want their package enhanced? I really feel it would add to the overall theme of the apothecary bottle too. Also, my biggest complaint is that these sauces are just not thick enough to stand alone. Perhaps, as thin as they are, they work really well into foods and recipes, but I’m reviewing a sauce as it stands alone, and they’re just a bit too thin for me. Having said all that, I *do* recommend you try these out – as a matter of fact, get a twin pack of the pair. You won’t be sorry, they taste great, and hey… you may even want to come back and chime in on the comments and offer your opinion! You can purchase any of their sauces at NWElixirs.com or at any of the locations listed on their site. I had a lot of fun writing this review, so I hoped you enjoyed reading it. They really are a great pair of sauces to try. Great review as always. The #1 Hott Sauce looks a little bubbly/fizzy on top – was this just a reaction to being shook up in the bottle? Yes, the bubbles were definitely a result of the shaking of the bottle. Same with the #2, only not as much. Another great review brian. I really like the bottles too gives it that Snake Oil salesmen look. I will add those sauces to my must try list. The bottles rock. I ‘d be happy if more sauces were available in this format. With better “necks” on the bottles to prevent over-pour. Over-pour… I’m trademarking that word. Ha! Another great review. I love the idea of small batch sauces. @JAC’s … LOL – love your “snake oil salesmen” take! A big difference between the two, huh? I like salsa verde flavors so I wonder if the mild green sauce would be better used as a marinade ingredient instead of a stand alone hot sauce? I think you may have nailed a good use of the verde sauce, Chris. You’re right on the money here. Our sauces really are an “ingredient” as well as a great topical addition to any dish. You can check out our website for many of my personal recipes. Thank you very much for the great review. Really appreciate the response. It’s funny almost every one of our return customers that have tried #1 and #2 are split in the middle. I also wanted to let you know the reason for the thin consistency is actually because we do not add refined sugars or dextrose to the sauces, not that those are negative additives we just took the all natural route. Really stoked you got the complexity of the sauce, that is our biggest goal. Sorry it didn’t have more heat. We have another sauce in the works that will be Hottt. Thank you again for a great review. O.k. So the flavor is great we all agree. The consistency is thin I agree. Reading the bottle I notice there are no thickening agents. It is thick enough to coat the food. buy some alginin, guar gum, locust bean gum or xanthan gum. Mix it right it, and enjoy. There are other thickeners but from what I understand, these work well with acidic foods. Cristian, Chef Andrew explained the thinness of the sauce in the Comment just above yours. They went the all natural route.